Lucas van Leyden (Leiden, 1494 – August 8, 1533 in Leiden), also named either Lucas Hugensz or Lucas Jacobsz, was a Dutch engraver and painter, born and mainly active in Leiden, who was among the first Dutch exponents of genre painting and is generally regarded as one of the finest engravers in the history of art. 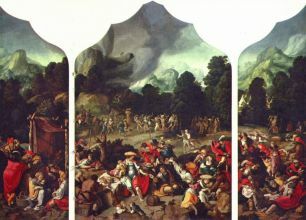 He was the pupil of his father, from whose hand no works are known, and of Cornelis Engelbrechtsz, but both of these were painters whereas Lucas himself was principally an engraver. Where he learnt engraving is unknown, but he was highly skilled in that art at a very early age: the earliest known print by him (Mohammed and the Murdered Monk) dates from 1508, when he was perhaps only 14, yet reveals no trace of immaturity in inspiration or technique. In 1514 he entered the Painters' Guild at Leiden. 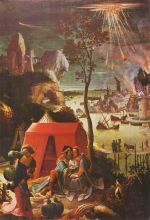 He seems to have travelled a certain amount, and visits are recorded to Antwerp in 1521, the year of Dürer's Netherlandish journey, and to Middelburg in 1527, when he met Jan Mabuse. An unbroken series of dated engravings makes it possible to follow his career as a print-maker and to date many of his paintings, but no clear pattern of stylistic development emerges. Dürer was the single greatest influence on him, but Lucas was less intellectual in his approach, tending to concentrate on the anecdotal features of the subject and to take delight in caricatures and genre motifs. Carel van Mander characterizes Lucas as a pleasure-loving dilettante, who sometimes worked in bed, but he left a large oeuvre, in spite of his fairly early death, and must have been a prodigious worker. 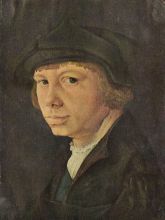 Lucas had a great reputation in his day (Vasari even rated him above Dürer) and is universally regarded as one of the greatest figures in the history of graphic art (he made etchings and woodcuts as well as engravings and was a prolific draughtsman). 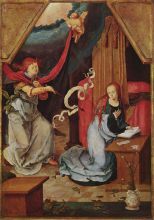 His status as a painter is less elevated, but he was undoubtedly one of the outstanding Netherlandish painters of his period. 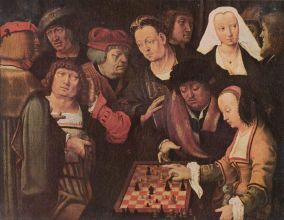 He was a pioneer of the Netherlandish genre tradition, as witness his Chess Players (Gemäldegalerie, Berlin) which actually represents a variant game called 'courier' - and his Card Players (National Gallery of Art, Washington), while his celebrated Last Judgement triptych (Lakenhal Museum, Leiden, 1526-27) shows the heights to which he could rise as a religious painter. It eloquently displays his vivid imaginative powers, his marvellous skill as a colourist and his deft and fluid brushwork.